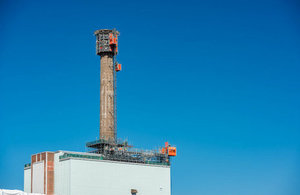 The first blocks of concrete have been removed from the top of one of the world’s most recognisable chimneys as the start of the demolition of Sellafield’s Windscale Pile One stack. This marks the start of the demolition of Sellafield’s Windscale Pile One stack. The 125m tower – the scene of Britain’s worst nuclear accident – will now start to disappear. Workers are cutting out 6-tonne ‘chunks’ of concrete using diamond wire saws. The blocks are then removed with the help of a giant crane, which at 152 metres is the tallest structure ever built at Sellafield, just six metres shorter than the Blackpool Tower. The Windscale Pile One chimney, with its distinctive top-heavy appearance, has dominated the Sellafield skyline for nearly 70 years. The first piece to go will be the square-shaped ‘diffuser’ at the top, which will disappear before 2022. Famously, this bulky filtration system was a last-minute addition, placed unusually at its summit. Despite being mockingly referred to as ‘Cockroft’s Folly’, after its designer Sir John Cockroft, it turned out to be a masterstroke. In 1957, fire broke out in the Windscale Pile One reactor. The sky-high filters captured an estimated 95 per cent of the radioactive dust created. Now, the chimney is a decommissioning project. Teams from Sellafield Ltd and its supply chain are working together to safely pull it down. The project is a collaboration between Sellafield Ltd and the supply chain. Partners include: DSA Progressive Alliance (Cavendish and AECOM) for design and engineering, DDP Framework ADAPT (Doosan Babcock, Atkins, and AREVA) for procurement and construction, and Access Installation Framework (Kaefer Engineering) for scaffolding systems. Because buildings containing nuclear material surround the stack, traditional demolition techniques like explosives cannot be used.